Yesterday I introduced A Theological Defense of Darwinism, Intro, which is a segue into the next few posts. Continuing with my comments, let us assume we were stranded on a deserted island. There was enough food, fresh water, shelter and clothing, but we were bored. So we get on our knees, pray to God, and voila! A crate full of books washes up on the shore, novels and puzzle books. God has answered our prayers, we’re not bored anymore. I don’t think most religious adherents would object to that hypothetical story. So what has that to do with Darwinism? There are many people who believe that God created the universe, and everything in it. But we already noted that most people are OK with small evolution, the sort that creates variations among roses, irises, and even people. But larger evolution, particularly evolution as the creator of, life is not so readily accepted. But if we say that God created everything, then we would have to admit that He went through a lot of trouble to make it look like evolution played a key role in life. He left all sorts of fossils in the ground; fundamentalists argue those are antediluvial, but the Bible doesn’t mention those animals. It doesn’t mention, for instance, a T. rex in the Garden of Eden, nor Eastwards afterwards, and that isn’t the sort of thing you just forget to mention: “Oops, honey, I forgot all about the milk. With that, frequently different types of fossils are arranged in different soil and rock levels, suggesting that they weren’t here at the same time. Perhaps some of these fossils are not remains of animals that actually existed; under creationism and for our discussions here, it is totally unimportant. God may have just put them there. In addition to the fossil record, God used the same genetic patterns over and over again, in ways that strongly suggest that not only is all of life related, but suggests how it is all related. Those repeated genetic patterns, in turn, produce repeated physical and physiological patterns, over and over, that group together similar living things, such as fish and reptiles, but also mushrooms, fruit trees and clams. Those related groups of living things present a series of patterns that suggest increasing complexity: fish, amphibians, reptiles, mammals, apes, man. We may not be related to monkeys and apes; but I’ve never heard a creationist say we don’t look like we’re related to monkeys and apes. 1)Of course in my particular case, I’ve had detractors who rather rudely suggested the resemblance is remarkable. Finally in these considerations, one of the most fun examples (if you think stretching your mind is fun and I do and we’ll come back to that) is the embryological record, how humans and all animals develop before we hatch or are birthed into the world. There is the expression, “Rarer than hen’s teeth.” But while still inside the egg chickens do, indeed, grow teeth. And then the teeth disappear. Even humans grow slits where fish have gills, and in the womb we briefly have tails. These almost always go away. But not always. Sometimes little tails have to be addressed surgically. So it seems to me that the faithful should ask, Why did He go through all this trouble? And please don’t tell me it was the Devil’s work, that’s a cop-out. You guys said that the Bible is the source of knowledge, and it doesn’t mention the Devil creating anything. Either God created the entire universe, or He did not. Next up: Dad’s Bathroom, The Pulitzer Prize, and Why I’m a Monkey’s Uncle. 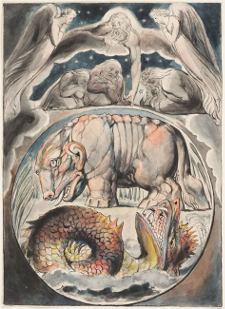 Picture: William Blake, Behemoth & Leviathan, courtesy Wikimedia.org. This print suggests God created animals that no longer exist. Of course, you have to wonder how we lost the Leviathan, or any of the swimming dinosaurs (OK OK OK OK they were actually pleiosaurs, mososaurs and ichthyosaurs, don’t sic your 12 year-old on me) in Noah’s flood, but I’ll leave that to the fundamentalists. Actually when I read the Biblical passage on the Leviathan, it sounded to me like a hippopotamus, not a whale. Hippos can be vicious and quite deadly when provoked. In this print, however, it’s the Behemoth that looks like a hippo. Artistic license. 1. ↑ Of course in my particular case, I’ve had detractors who rather rudely suggested the resemblance is remarkable. There is an alternative between the fundamentalist view that dinosaurs lived with men, and the opposite view that everything evolved by physics and chemistry. That view would be that the universe was created with an intelligent design, providing for those repeated genetic patterns, and allowing for the normal evolution that your past post explained so succinctly. This view provides for a belief in God, and a belief in the scientific evidence provided by fossil records, and the “small scale” evolution that we know exists. Sure. See my reply to Ann in the post, “A Theological Defense of Darwinism, Intro.” We view the world through paradigms, and we assume that certain things are ‘true.’ But each generation discards things the previous generation knew was true. There is no good evidence that humans lived with dinosaurs. But there are places where the fossil record is confusing, we believe because of disturbances in the geologic strata. We have to reach some conclusions in order to make decisions and to get on with our lives. But to constantly make better decisions, we need to be constantly skeptical of what we think we know. A person is smart. People are dumb, panicky dangerous animals and you know it. Fifteen hundred years ago everybody knew the Earth was the center of the universe. Five hundred years ago, everybody knew the Earth was flat, and fifteen minutes ago, you knew that humans were alone on this planet. Imagine what you’ll know tomorrow.